The Hendrick Gulch trail is located in the Ironton Park area of the Uncompahgre National Forest south of Ouray, Colorado. 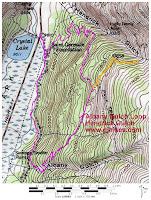 The trail begins off of the Albany Gulch Loop where it does a quick out and back to Hendrick Gulch. 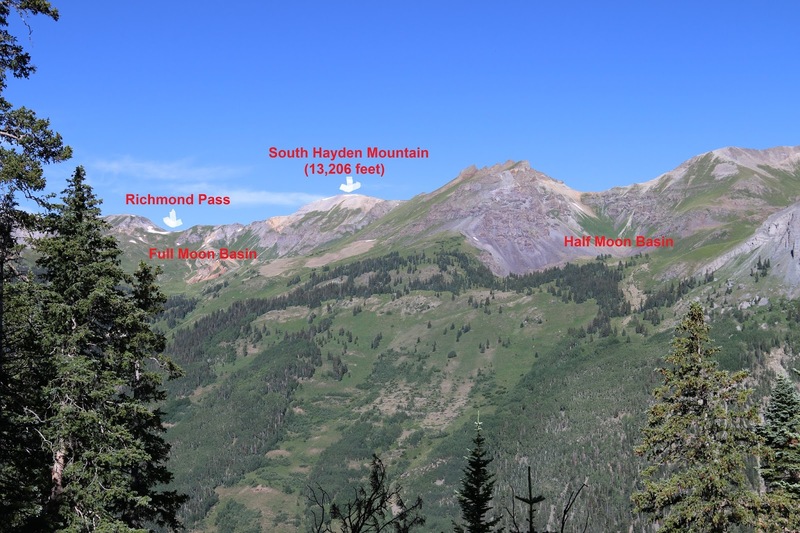 Along the way there are good views of Hayden Mountain, Half Moon Basin, Full Moon Basin and portions of the Red Mountains. Once at Hendrick Gulch there are views looking up at Abrams Mountain and across the gulch at the Guadalupe Mine. By itself the Hendrick Gulch trail is only a half mile long one-way but to get to it will require almost an additional 4 miles via the Albany Gulch Loop. The trail begins at the 1.85 mile point of the Albany Gulch Loop. There is a trail marker nailed to a tree at the turnoff as well as a cairne. The actual writing on the current trail marker was readable but pretty faded so we printed over top of it in this photo. The Hendrick Gulch trail comes as a pleasant stroll after the steep climb up the Albany Gulch trail. There is still a couple hundred feet of elevation gain but it is on a more gradual slope. If you get tired you can take a break and look back over your shoulder at the views of the Red Mountains. They are stunningly pretty from any place that you can see them and from here is no exception. The second half of the trail enters the trees where it is more secluded. Even though the trees block out the distant views they create another world of enchantment to explore. Just before reaching the gulch the trail passes the remains of a foundation from a building that once occupied the space. The trail comes to an abrupt end at the gulch where the remainder of the route to the Guadalupe Mine has been washed out. The sun has been shining for several hours already in Ironton Park but on the western flanks of Abrams Mountain (12,801 feet) it was just beginning to make a showing. The tailings piles and much of the lumber from their previous works are visible across the gulch. With its more elevated position the views from the Hendrick Gulch trail might be a little better than from the Albany Gulch Loop. 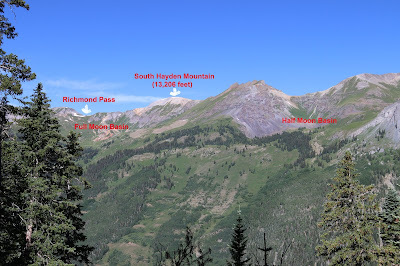 Looking across Ironton Park you can see South Hayden Mountain with Full Moon and Half Moon basins as well as Richmond Pass. Looking up the valley to the south the Million Dollar Highway can be seen climbing Red Mountain Pass. The elevation here is about 5 feet higher than the passes summit. 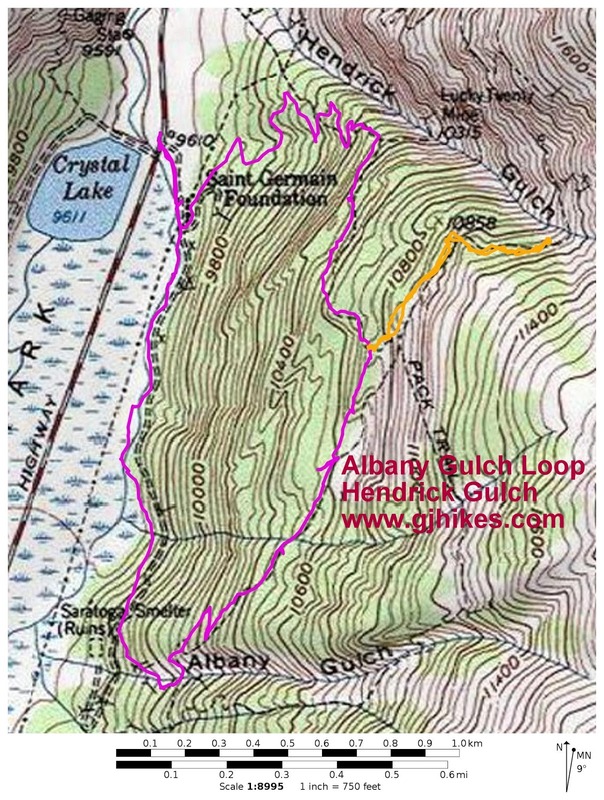 The Hendrick Gulch trail is a nice excursion when hiking the Albany Gulch Loop. It added an hours worth of time for us but we sat around for at least 15-20 minutes of that waiting for the sun to shine over Abrams Mountain before heading back. If you would like to see it for yourself then all you have to do is 'Take a hike'.